I have a weak spot for chicken salad. If it’s on the menu, 9 times out of 10 that’s what I’ll order. Problem with chicken salad is that it’s easy to screw up. I’ve had my fair share of bland, chopped too fine, or swimming in mayo chicken salad. I hit the jackpot when I lived in Birmingham, Alabama. O’Carr’s in Homewood is absolutely the best chicken salad I’ve ever eaten…ever. You can get a plate of it with all kinds of delicious fruit or as a sandwhich where they add slices of uber thin cucumber. It’s to die for. This Contessa Chicken Salad is the only recipe I’ve found so far that comes pretty close to O’Carr’s. 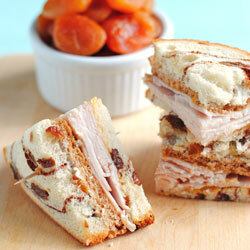 It’s got nuts and grapes and is full of flavor. It’s the first thing I thought of to serve for my friend’s recent bridal shower. 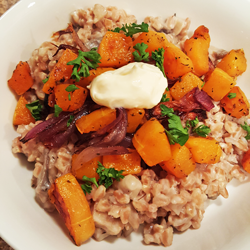 I’m such a fan of this recipe. You can roast the chicken yourself or buy a rotisserie chicken. 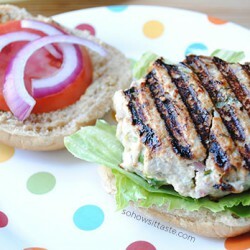 For a good chicken salad, you need to have flavorful chicken. Roasting chicken with skin on and bone in gives you this or use the juicy meat from a rotisserie chicken. I’ve done both and each one works great. What I like about this chicken salad is that it’s not heavy. It’s got sour cream and mayo, so it’s not weighed down by all mayo. I use reduced fat versions of both and it doesn’t sacrifice any flavor. 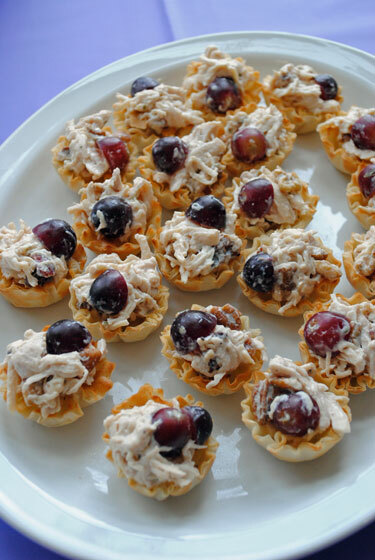 I like chicken salad to have substance to it, so I lean towards the kind with fruit and nuts. This recipe uses pecans and walnuts for a big, nutty crunch. Grapes are a must for me, too, and you can use green or purple or any kind you like. The burst of freshness from the grapes helps break up the dressing. The last ingredient that makes this salad stand out from the rest is tarragon. Tarragon is perfect in chicken salad. It gives it a boost from just using salt and pepper. 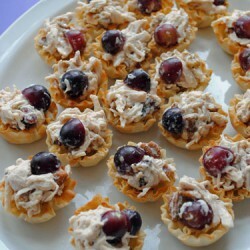 For the shower, I served the chicken salad in mini fillo shells. You could also serve a scoop of this on a lettuce leaf or a favorite way of mine to eat it is on a sandwich. I like to mimic O’Carr’s and slice cucumber super thin and add it to the sandwich. It’s unbelievably good! 1. Preheat the oven to 350F or if you're using meat from a rotisserie chicken, skip to step 3. 2. Place the chicken breasts, skin side up, on a baking sheet and rub them with olive oil. Sprinkle generously with salt and pepper. Roast for 35 to 40 minutes, until the chicken is cooked through. Set aside until cool. 3. When the chicken is cool, remove meat from the bones and discard the skin and bones. Cut the chicken into a 3/4-inch dice. 4. Meanwhile, place the pecans and walnuts on a separate sheet pan and toast in the oven for 7 to 8 minutes until golden. Set aside to cool. 5. For the dressing, mix together the mayonnaise, sour cream, 2 teaspoons salt and 1/2 teaspoon pepper. Fold in the chopped tarragon leaves. 6. Place the diced chicken in a bowl, add the pecans, walnuts and grapes. Pour the dressing over the chicken and toss well. 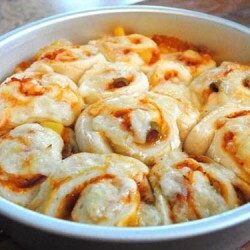 Serve on top of lettuce leaves, between bread for a sandwich, or in mini fillo shells.